Today the leading healthcare organizations are focusing on content in order to win the race of digital supremacy. The content marketing strategies for healthcare sector is not just about blogging and producing tangible results. When it comes to hospital branding, it may sound a bit odd. Because the hospitals are about patients and doctors. But the digital marketing is the way to take this process to a whole new level. At this point, the content comes to the rescue that helps in building a positive impression of the brand. People these days are even searching for doctors online. The options are so much that they read the reviews and then decide which doctor to consult. So now that the patients know where to find their fit, this also the perfect time for the healthcare sector to engage the patients through content and marketing it on various social media platforms. When we say, content marketing strategy for the healthcare sector, there is always one goal. The goal is to keep the customers updated with whatever is happening in the medical world. If you are having blogs and whitepapers on your website, then it will be of no use if you are putting it on social media sites. People like to read content that is quick to understand and which is not too long. Therefore creating an infographic of the blog and the whitepaper will hold more importance on social media channels. Infographics are the most effective way to let people know what exactly the content is all about. A good graphic design can help in showcasing the data in a better manner. A hospital communicates with the patient every minute. There are lot successful surgeries take place every day. So here, you can ask a patient to share the experience that they had in the hospital. If the patient has some positive story to share, that will be a good content for you to make viral on social media. You can make a video of that and post it. Basically, you are treating the patient more like an influencer. Urge them to celebrate their success and happiness with you. Also, don’t forget to ask for their opinion. This will not only help you get good content for the brand but also help in building a good relationship with the customers. When it comes to the hospital branding strategy, it is all about having an interactive content. For people, a hospital is the most boring and scary place to visit. So how to make feel good about it? Share some interactive content with them like share some stories related to the data or some did you know facts. Share something that they will feel like reading and sharing. 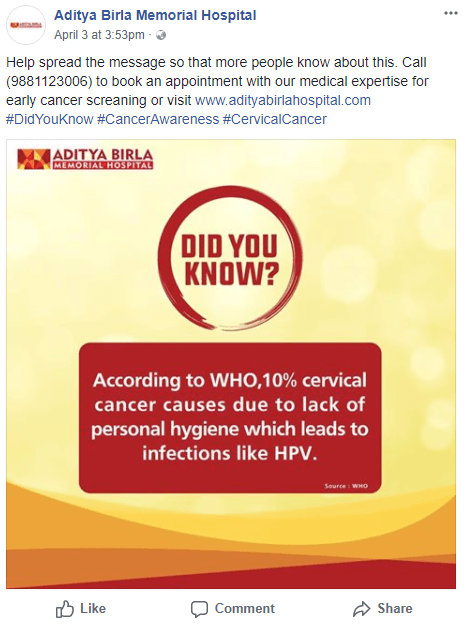 As you can see in the below screenshot, Aditya Birla Memorial Hospital has shared good facts about cervical cancer. People are actually unaware of such facts. Therefore, making them educated through some informative and interactive content will never go in vain. You can also conduct some quiz competition in order to create more engagement. 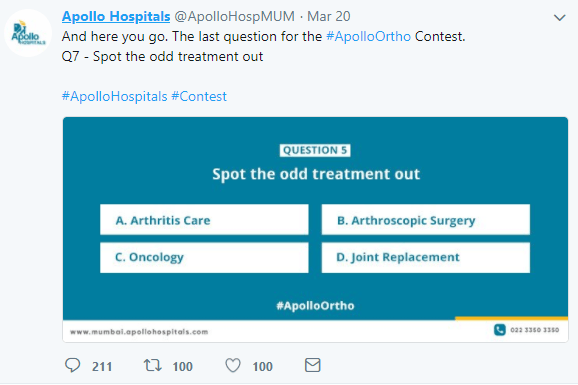 Apollo Hospital conducted quiz competition on Twitter and received a lot of engagement. So this kind of strategies works a lot on a platform like Twitter. 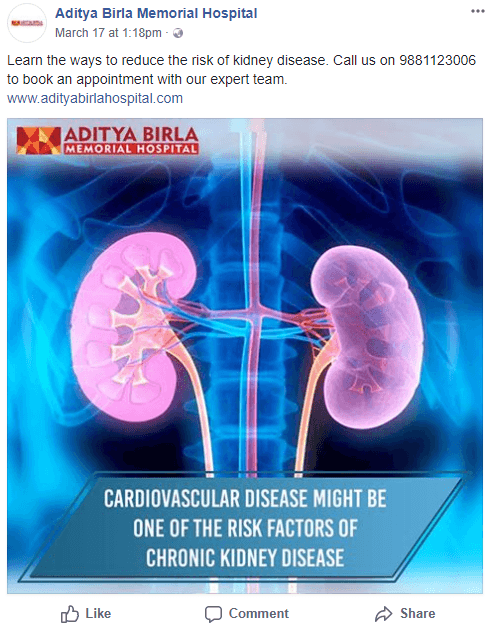 So now you must be thinking that what does influencer marketing even mean for the healthcare sector. You can’t just showcase a celebrity going for an MRI scan. But apart from that, you can search for those people who are involved in sharing and writing content on medical sector. Getting in touch with medical bloggers or some famous doctors will be a good start for influencer marketing. 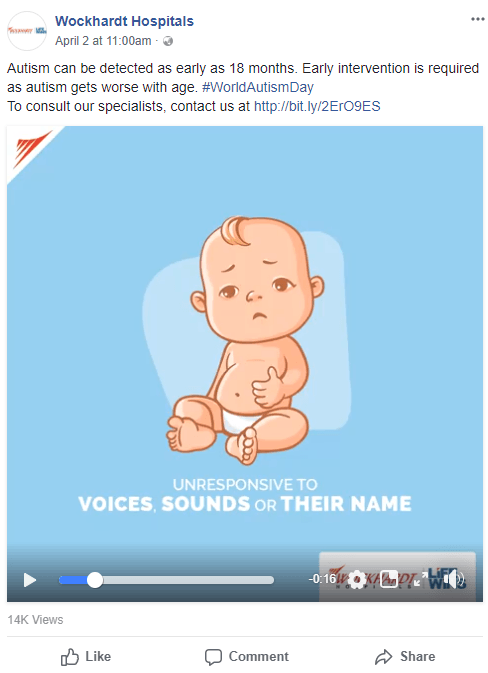 If you request a famous pediatrics doctor to talk about baby healthcare and share that video on social media channels then people will definitely watch it. As the new moms are always worried about their child’s health. Follow them on social media, share their content, and then reach out with a small request. Continue to build the relationship, and you can move to interviews, guest blog posts, even full co-creation on a major content asset. The medical field is vast and every other day, there are new technologies coming up. Therefore try to share it with the audience. 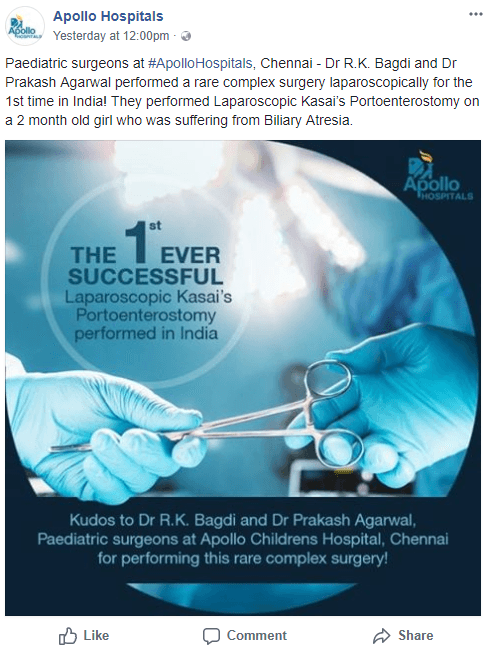 For example, Apollo Hospital performed a surgery that is first of its kind in India. Therefore sharing such kind of content will really impress the audience and builds the trust among the patients. When it comes to healthcare, it is all about making people aware of different diseases, symptoms, and cure. Therefore sharing some kind of content that looks interactive but also at the same time helps in creating awareness among the people will be a good strategy to follow. Telling the patients about the symptoms of heart stroke, what can be done to cure kidney stone etc will be good for the audience. You will be sharing content regarding the facts and figures of the hospital. Also, your content strategy will include the various schemes for the patients for check up etc. But never forget to add the special days in the strategy. It is important to let the patients know every now and then that you care or them. So days like World Health Day, Autism Day should be put up on social media channels. This makes the audience think that your brand is much more than just a mere hospital. Wockhardt hospital created a nice video on World Autism Day. They shared of how parents can detect the symptoms of Autism at an early age of the child. It is important to use relevant and trending hashtags if posting on twitter. This helps in building engagement. Therefore if there is any special day coming then the hashtag definitely trends on twitter. So make sure that you are using that hashtag in your twitter post. 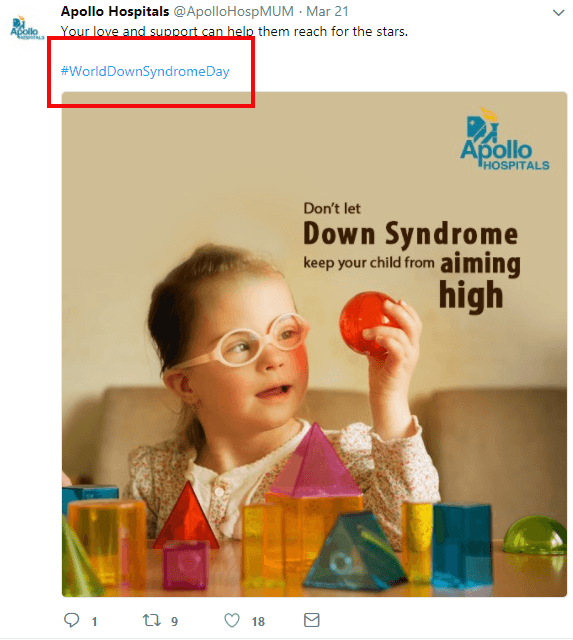 Apollo Hospital used the most trending hashtag of #WorldDownSyndromeDay while posting on Twitter and received pretty good engagement. If the hospital is conducting any activity like blood donation camp or free check ps or any other corporate social responsibility activity, then do share it on all the social media channels. This helps in knowing people that the hospitals do more than just conducting surgeries and OPDs. Post real-time pictures on Facebook and Twitter and let people know about the updates of the activities. This form of marketing is considered as the most effective ways to convey the message to the audience. Sending emails that have your latest content like any blog posts or any other recent information of the hospital will be a good source to chip in. Sending the content via emails also gives a personalized touch to the audience and they prefer reading it as according to them, the source is authentic. Also keeping a call-to-action button can be a helpful element to get leads. It is necessary to give your content strategy a full body workout. Therefore creating a content marketing strategy for healthcare sectors by keeping every aspect in mind is very important. Hospital branding strategies should include a unique selling point that will attract the audience towards it. Now that you know various elements to include while creating a content marketing strategy for your healthcare brand, make sure you do it with utmost carefulness. A good strategy will help you develop relationships, and ultimately drive purchase decisions with a holistic content fitness routine.